What a kookier way to begin HSRT’s summer of love than with The 39 Steps! Combine a Hitchcock masterpiece with a juicy spy novel, throw in a dash of Monty Python and you have The 39 Steps, a fast-paced whodunit for anyone who loves the magic of theatre! This 2-time Tony® and Drama Desk Award-winning treat is packed with non-stop laughs, over 150 zany characters (played by a ridiculously talented cast of four), and some good old-fashioned romance! 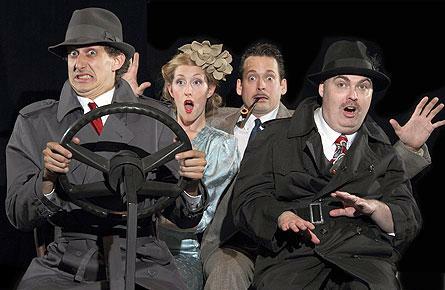 Adapted by Patrick Barlow, from the novel by John Buchan and from the movie of Alfred Hitchcock, The 39 Steps runs for a limited engagement at the Knickbocker Theatre (86 East 8th Street) on June 14, 15, 19, 20, 26, 27, 29, and July 6 at 8:00 p.m.
Richard Hannay’s mysterious new acquaintance, Annabella Schmidt, brings more than just company to his quiet English home; she brings with her a secret vital to the safety of the country itself. Before she can reveal her secrets to Hannay, she is murdered, leaving him without any answers. With only a few clues to guide him, it is now up to Hannay to find the 39 steps, which she spoke of, prove his innocence, and save England. Playing the role of Richard Hannay is Russell Jonas (Dallas, Texas), who made his HSRT debut last season in Pride and Prejudice and An Inspector Calls, as Charles Bingley and Gerald Croft respectively. Kate Thomsen (Holland, Mich.), who will take on the role of Annabella Schmidt, is returning for her second season as well; last season playing Mrs. Gardiner in Pride and Prejudice. Newcomers to HSRT, Glen Forbes (Ada, Mich.), originally from Dublin, Ireland joins the cast in The 39 Steps as Clown 1 and Joshua Kumler (Jupiter, Fla.), a senior at Southern Methodist University, will be Clown 2. The 39 Steps is directed by longtime Hope College faculty member and founder of HSRT, John Tammi. The production team for The 39 Steps is: Stage Manager Rebekah Carriere, Scenic Designer Micah Maatman, Lighting Designer Erik Alberg, Costume Designer Jodi Ozimek, Sound Designer Amanda Were, Props Master Wyatt Tilke, Charge Artist Aaron O’Neill, Master Electrician Krystal Martinez, and Costume Shop Manager Jessica Leslie. Take advantage of Hope Summer Repertory Theatre’s best ticket offer and purchase a season ticket package. A season ticket package saves theatre goers up to 27% off individual ticket prices and guarantees a terrific seat for every performance! With free exchanges, purchasing a season ticket package is the best way to support HSRT. Season packages are now on sale at the DeWitt and the new 8th Street ticket offices. The Season Package includes mezzanine seating for four main stage performances and our bonus show for only $87 for adults and $82 for seniors. The Best Buy Package includes admission to the four main stage productions for $67 for adults and $62 for seniors. The Super-Saver Package includes seating limited to the balcony and orchestra for our four main stage productions for $50 for adults and seniors. The Children’s Package is great for children under 12 and includes tickets to both CPT performances and one ticket to any main stage show for $25. The Adult CPT Package is great for parents and includes a ticket to both CPT performances and one main stage performance for $40. Add an additional performance and pay $60 for our Bonus Individual tickets are now on sale at the DeWitt Ticket Office (141 E. 12th St) Monday through Friday 10:00 am - 5:00 pm and beginning June 15 Saturdays from Noon - Intermission. Our new 8th Street Ticket Office (100 E. 8th St - Main Level) is open Monday through Friday 10:00 am - 5:00 pm. Prices range from $12 - $21 for The 39 Steps. Patrons can purchase individual tickets online by visiting hope.edu/hsrt or calling 616-395-7890. For more information visit the HSRT website at www.hope.edu/hsrt or www.facebook.com/hopesummertheatre. A Hope College senior who has been representative of the NCAA Division III scholar-athlete model is being recognized through the Capital One Academic All-American program. Dr. James Herrick of the Hope College communication faculty is co-editor of a book that emphasizes the role of language in discussing biotechnological advances and how terminology itself shapes how such developments are perceived.